Accounting Basics for Students is the best source of free basic financial accounting information - a site that has the simplest accounting tutorials, explanations and examples on the net! My name is Michael Celender. I’ve been tutoring, lecturing and helping accounting students for a number of years. I created this site to help students and working professionals around the world learn financial accounting basics. Double Entries is chapter 3, and so on. These 6 chapters on their own (52 accounting tutorials in total) are enough to give you a very solid understanding of accounting – basically a free accounting course online. I recommend going through the lessons on this site in order, starting with Basic Accounting Concepts. This is essential if you're new to the subject. But even if you're not new to accounting but just feel kinda confused, then you should just start from the first lesson and then move forward (the earlier lessons are pretty quick anyway). If you're looking for information on a specific accounting topic, use the "Search" tool. You can usually find this on the top-right of your screen or right at the bottom of the page. Use this search feature and it'll show you all the web pages, lessons and accounting questions on this site that deal with your specific topic. Want to Practice Accounting Questions? One of the most important things when studying accounting is to practice questions and exercises. It's only through practice that you'll become truly proficient at doing accounting. For that reason I've tried to provide lots of free questions that can help you improve your skills across various accounting topics. Basic Accounting Questions - questions and answers about beginner topics. Full Accounting Questions and Answers - full exercises with accompanying solutions, as well as questions and answers about advanced topics. Additionally, at the bottom of each of the 52 lessons on this site you can find questions related to that specific accounting topic which have been submitted by visitors, many of which have been solved for your benefit (if the questions have not yet been solved, you can help your fellow accounting students by adding a comment where you try to answer the question). You can also post your own comments (and questions) using the Facebook comments sections, located at the bottom of every page. 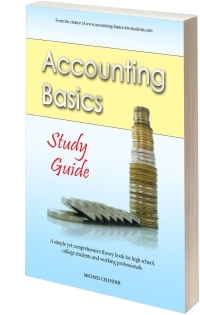 If you like the information on this site then I'd recommend you get the full book - Accounting Basics: Complete Guide. Not only does it contain all the lessons on this site (without any advertising!) but it also has additional lessons on special accounting topics, as well as its own accounting dictionary and plenty of exercises to test your understanding. Hope you enjoy the website and excel in your studies! P.S. The accounting information presented on this site is in line with both U.S. and international accounting 101-type curricula, as accounting basics are virtually identical the world over. Only minor terms and methods may differ from one country to the next. P.P.P.S. Please like and share our lessons & questions with your friends!! !